It’s not often I get anything new that is Origin related these days so one of the more welcome things to pop through the letterbox recently was the CD for the orchestrated Wing Commander soundtrack. This was a result of a Kickstarter back in early 2014 by composer George Oldziey to bring his music to life with a real orchestra. Like nearly every Kickstarter, it’s been quite the wait for the physical product. Unlike plenty of other Kickstarters I could mention, there has been steady progress and updates throughout and it’s a prime example of crowd funding done right. The orchestral recording itself was done back in October 2014 and released to backers digitally a little later once mastered. The $42,000 raised wasn’t exactly a huge amount when paying for a full symphony orchestra so the recording was done in Bratislava with the Slovak Symphony Orchestra where the wages are more affordable. They might not get paid as much but it has to be said they did a fantastic job. The original WC3 + WC4 soundtracks were undoubtedly some of the best to ever come out of Origin probably only beaten by Ultima 9 several years down the line. The new recordings surpass those and then some. The music was already symphonic so the transition works perfectly. Most of the music chosen is from WC3 and WC4 which is just what I would have wanted. There is also a track from Prophecy which is more atmospheric and alien. In addition to the orchestral recordings, Oldziey has done some digital re-orchestration using modern equipment to add another 15 minutes or so to the CD. Technology has come on to the point where these don’t sound all that much worse than the real thing. If I recall correctly, these weren’t actually funded in the Kickstarter but were added on anyway. As far as the packaging, it comes in a little cardboard sleeve with the CD on one side and a booklet with some more photos and the names of all the backers above a certain level. For what is such a limited release, it’s a smart looking package. This is one Kickstarter than I’m definitely not sorry I backed and has in the end delivered more than I expected. It could never have happened without crowd funding and is a reminder as to why it took off in the first place. 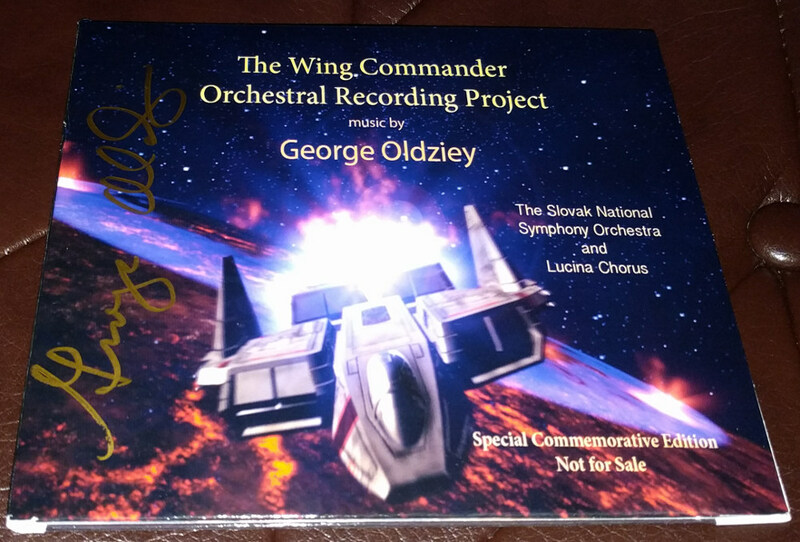 The soundtrack is actually still available to buy at http://oldzieymusic.com/wingcommanderCD.html for an admittedly pricey $40 for a physical non-autographed copy but that’s considerably less than the original backers had to put in. I seriously doubt it will ever see a wider and cheaper release as it’s about as niche as it gets. For anyone who enjoyed those games as much as I did, it has to be worth the money. You can also get a digital download if that’s your preference at half the price. This entry was posted in Wing Commander 3, Wing Commander 4, Wing Commander Prophecy by Pix. Bookmark the permalink.